It is with great sadness that I lost my beautiful Mum on the 20.3.2019. With love from husband Norman, daughter Lesley and son Peter (all dec) and Irene. 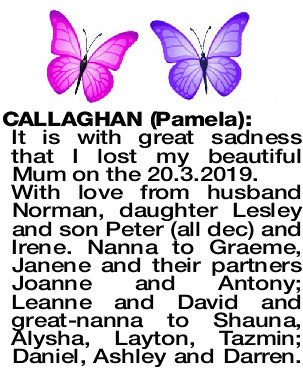 Nanna to Graeme, Janene and their partners Joanne and Antony; Leanne and David and great-nanna to Shauna, Alysha, Layton, Tazmin; Daniel, Ashley and Darren.